On the last day of the high-stakes and high-profile Harvard admissions trial, "the wolf of racial bias" returned to the courtroom. Lawyers for both Harvard and Students for Fair Admissions, the anti-affirmative action group suing the University over its admissions process, approached the wood-paneled witness stand one after the other Friday to deliver impassioned closing statements and rebuttals that stretched for hours. Summing up what transpired during the three-week-long trial — ranging from battles over data to administrators’ repeated denials of wrongdoing to emotional and personal testimony from students — was a tall order. But the attorneys did their best. Harvard’s lead lawyer William F. Lee ’72 took things back to the beginning. 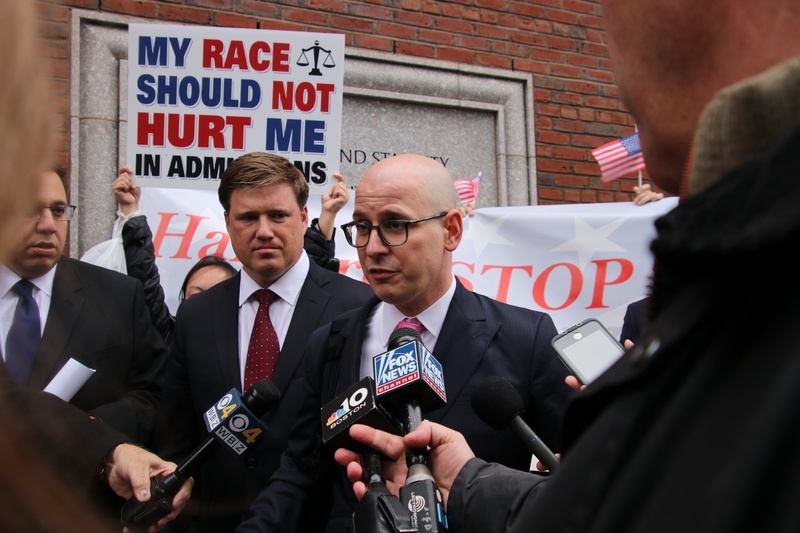 On the trial’s first day, SFFA attorney Adam K. Mortara had declared that Harvard had “let the wolf of racial bias” through its front door. 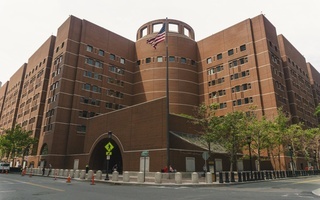 The trial kicked off Oct. 15 in Courtroom 17 of the John Joseph Moakley United States Courthouse in downtown Boston. Its launch came almost exactly four years after SFFA filed suit against the University in Nov. 2014 alleging that Harvard discriminates against Asian-American applicants. The trial saw 15 days of extensive quibbling over every twist and quirk of the Harvard admissions process, as well as secret-spilling that revealed in unprecedented detail how the College evaluates applicants. But it did not decide the veracity of SFFA’s charges. Judge Allison D. Burroughs will make that ruling on her own, without a jury; she is not expected to offer a final verdict for several months. Friday’s proceedings drew massive public interest. Onlookers — including parents, locals, and a bevy of undergraduates, many of them donning Harvard gear — packed Courtroom 17 and spilled over into two overflow rooms. Surveying the large crowd, Burroughs urged lawyers to speak clearly into the microphone. “You have a cast of thousands hearing what you have to say this morning,” she said. Students for Fair Admissions lawyer Adam K. Mortara takes questions outside the courthouse soon after the trial concluded. SFFA lawyer John M. Hughes spoke first, delivering a fiery oration that lasted over an hour. He appeared to grow emotionally invested in his own words, often slamming his fist on the table in front of him. “Harvard suggests Asian Americans are a group of one-dimensional academic superstars,” Hughes said. Then it was Harvard’s turn. 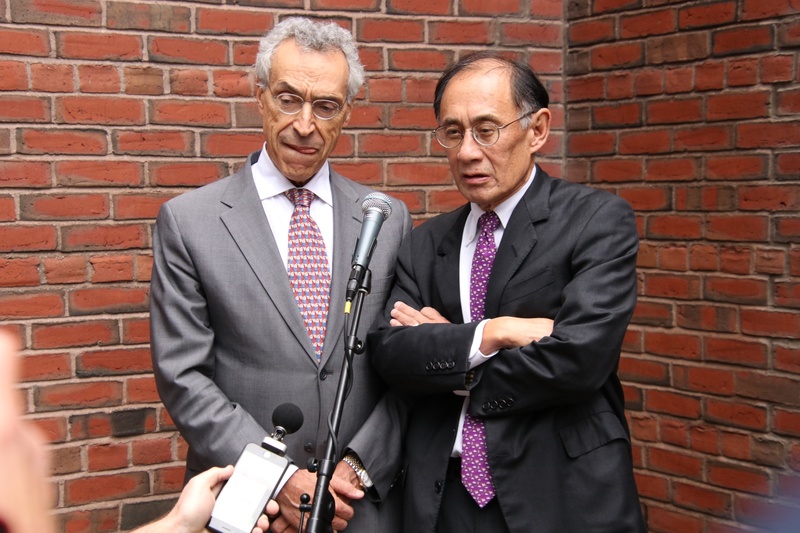 University lawyers Lee and Seth P. Waxman ’73 gave Harvard’s closing statement together. The duo leaned heavily on student testimony and on the work of David E. Card, an economics professor at the University of California at Berkeley whom Harvard paid to analyze its admissions data ahead of the trial. Card found that the College does not discriminate in its admissions process. 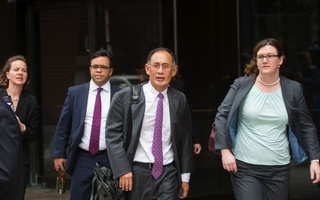 Lee noted that, while eight Harvard students and alumni took the witness stand to testify in support of the University in the third week of the trial, none of the students whom SFFA claims to represent showed their faces in Courtroom 17. 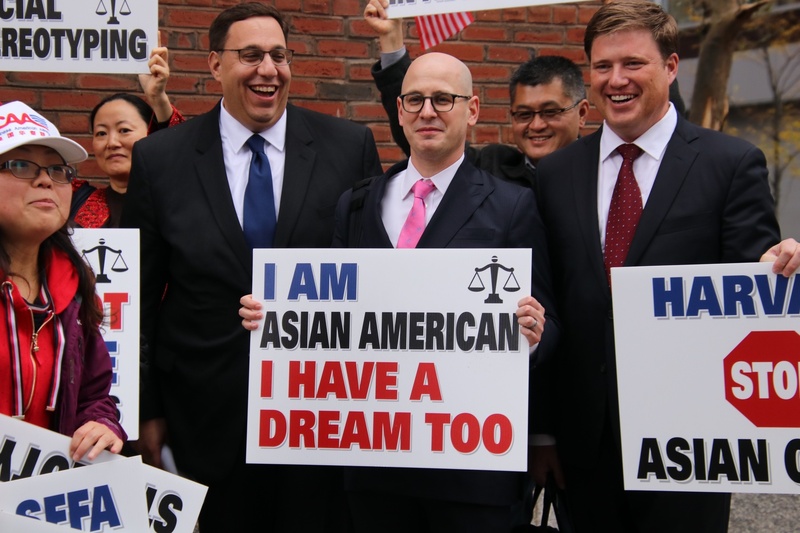 SFFA originally filed suit on behalf of several Asian-American students who allege they were unfairly rejected by Harvard; these students have chosen to remain anonymous throughout the lawsuit and trial. Lee thanked the eight Harvard students for their testimony, which he described as “powerful.” Each of the eight drew on personal experience — including tales of childhood bullying and fears of Harvard’s whiteness — to argue in favor of race-conscious admissions and against a race-blind process. "We’ve heard from the students themselves. We've heard from the students who are living diversity every day," Lee said. "Although much progress has been made, there is much to be done." 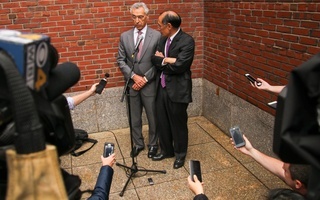 Harvard lawyers Seth P. Waxman '73 and William F. Lee '72 speak to reporters outside the courthouse on the trial's final day. The lawyers finished speaking around 2:30 p.m., marking a relatively early end for a trial whose proceedings often lasted until close to 5 p.m. But the case is far from over. Experts have said that, regardless of how Burroughs rules, the disappointed party is likely to appeal — and that a cascading series of appeals could bring the suit before the Supreme Court. The newly conservative court is more likely to side with SFFA than with Harvard, analysts have said. If it does, it could mean the end of affirmative action in the United States. 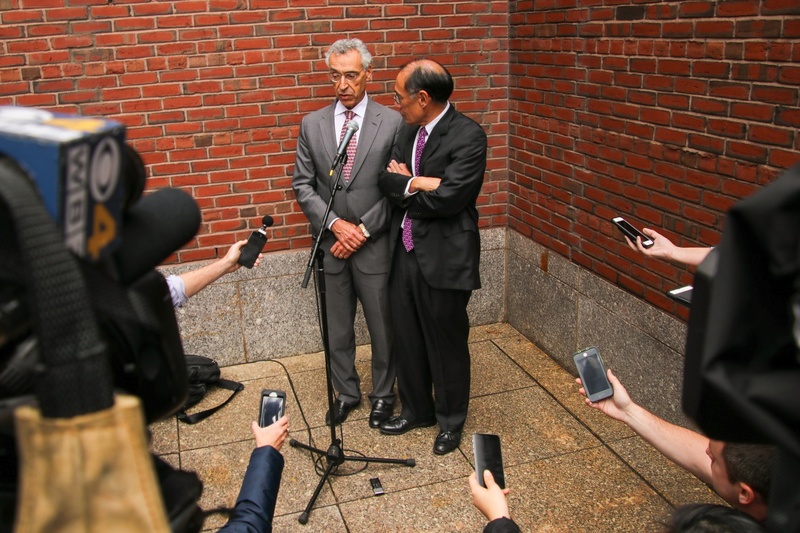 Over the past three weeks, five current and former high-up Harvard administrators called to serve as witnesses did their best to avert that outcome. Dean of Admissions and Financial Aid William R. Fitzsimmons ’67 was up first. He spent most of his four-day testimony defending his legacy as dean — a position he has held for over 30 years. Asked at one point whether the admissions office condones “stereotyping” of Asian-American applicants, Fitzsimmons answered without hesitation. Marlyn E. McGrath ’70, Harvard’s director of admissions, took questions from Harvard and SFFA lawyers on two separate occasions. During her first court appearance, McGrath confidently asserted Harvard has never issued written rules detailing how admissions officers may consider race when evaluating candidates. That didn’t turn out to be entirely true: Harvard added a section to its application “reading procedures” for the Class of 2023 that expressly forbids staffers from using race to calculate high schoolers’ personal scores. McGrath returned to the stand Thursday to face grilling over how and when administrators made that decision. 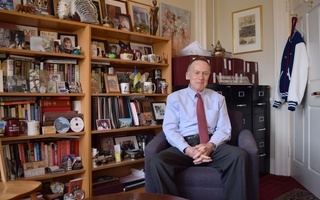 Soon afterward, former Dean of the Faculty of Arts and Sciences Michael D. Smith stepped up to defend the work of his namesake “Smith Committee,” formed in 2017 to research race-neutral alternatives to affirmative action. The committee concluded that "Harvard could not both achieve its diversity interests and achieve other equally important educational outcomes, such as academic excellence” — a finding Smith stuck to on the witness stand. Former University President Drew G. Faust was the final Harvard administrator called to the witness stand in Courtroom 17. Faust spent most of her time on the witness stand Thursday explaining and defending diversity initiatives she pursued as president. She particularly noted that the number of Asian-American students and faculty at Harvard increased during her tenure. Students for Fair Admissions lawyers pose for pictures outside the courthouse. The eleventh day of the trial, though, belonged to the eight student witnesses. The students, all of whom are non-white, said the elimination of race-conscious admissions would drive down the number of students of color who matriculate at Harvard each year. On a campus where minority enrollees already feel isolated and alone, this decrease would be nothing less than a disaster, the students said. At the close of the trial Friday, Harvard lawyers appeared confident that — for now, at least — Cole and other students of color do not have to worry. Basking in an unseasonably warm 70-degree afternoon, Lee and Waxman held forth outside the courtroom for several minutes after the trial ended, facing television cameras and an eager press corps. Lee admitted it is possible the case goes before the nation’s highest court. “But that would be a big change in the law, it would be a big change for universities like Harvard — and personally, I think it would be a disaster for the country,” he said. When asked whether, should Burroughs rule for SFFA, Harvard will appeal, Lee laughed. “I would say yeah,” he said. “There is no doubt about it,” Waxman added. William S. Consovoy, an SFFA lawyer, gave a similar answer during his own, separate press conference Friday afternoon. When a reporter asked if SFFA plans to fight the case all the way to the Supreme Court, Consovoy answered rapid-fire. “We’re committed to this case to the end,” Consovoy said.